So this post is about how to use digital I/O pins on the KL25Z to either turn on or off, or to read in values. In the LED tutorial I used my LED component to control them, but of course it is possible to do that kind of thing on a lower level: BitIO_LDD. 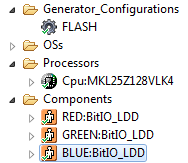 ❗ There is as well a BitsIO_LDD component available (notice the ‘s’). This one is able to deal with multiple bits in a port, but we want here just to do it with a single bit. ❓ Wondering about the RED_DeviceData parameter? The logical device drivers (LDD) components in Processor Expert need this. I will explore things how this can be optimized later on as the overhead caused by this is really not good even for such a powerful ARM Cortex-M0+ microcontroller. Time to create code (selecting the ProcessorExpert.pe file and context menu t ‘Generate Processor Expert Code’, build it and download it. The code should turn on the RED led, and then turn it off. Simple as that :-). Time to test it in my code. I know now how to configure pins for input or output, and how to set or read them. But there is more you typically can configure. Things like pull-up or pull-down resistors, slew rates or driving strength. All these settings are missing in the above components. But they are available in the non-LDD (Logical Device Driver) land :-(. 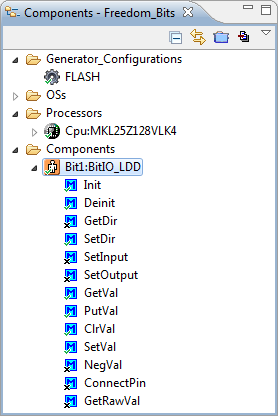 💡 For other Processor Expert supported (non-LDD) cores (like the S08), such hardware settings can be configured in the BitIO component. D15 is connected to the PTE1 pin on the KL25Z. And I want it as an input with an internal pull-up. So how to configure it? The trick is to use Init_GPIO with pin sharing. I’m now going to configure the hardware (internal pull-up) in an Init_GPIO. But: it means that it is enabled for sharing, and the error from above is fixed :mrgreen:. Time again to try it out on the board: it will turn on the green LED for a second and then turn it off. Then the LED will be off. If I press SW1, the led will be red (as above). 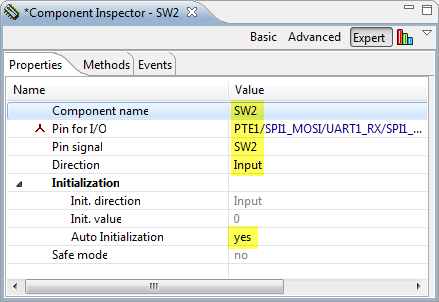 Doing Bit I/O really is easy with the Eclipse based CodeWarrior for MCU10.x. The project and source files created and discussed is available on GitHub here. This entry was posted in Boards, Kinetis, KL25Z Freedom Board, Processor Expert, Tips & Tricks and tagged CodeWarrior, Embedded Component, KL25Z Freedom Board, Processor Expert, Tips&Tricks by Erich Styger. Bookmark the permalink. I will study this carefully. Sorry again. The way this reply feature laid out on my computer, it appeared that my last comment, would appear before the comment now showing above it. So please delete this and the above two comments. I’m somewhat confused ;-). Maybe you could post your question again (if there is any)? My original question was about using PTB8-11 as pull down inputs. I have since learned that it is not possible to set them as pull down. So my question has been answered from another source. Nevertheless, THANK YOU for your help to so many people through this blog and the excellent tutorials you have provided. 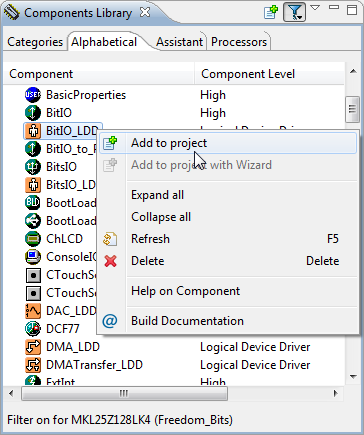 Can you put on your work list an example that links the two tutorials in order to transmit from a usb and receive from the other and vice versa ,obviously with FreeRTOS? yes, I have that working on my end for a while already, and I have seen your earlier request. It is just that I do this blog in my own time (means: at night and week-ends), and as such my time is limited. The thing is that have made major changes in my USB stack implementation to support things beyond CDC (I’m working on MSD and HID), and I had not much time to test it. It works on my end, but I’m reluctant to put things out there if I’m not sure if it is stable enough. I see what I can do for you. Will certainly be just as interesting and welcome the next tutorials on MSD and HID. I have extended the project with USB CDC, and it is available here: http://www.steinerberg.com/EmbeddedComponents/Examples/FreedomBoard/Freedom_Shell.zip. I will write up a short post on what is the difference tonight. Yes. But you are free to move that to another task, or mix-and-match things as needed. I am trying to make the Freescale Processor Expert SDHC examples work at 50 MHz. My card reports “High speed: true”. Unfortunately at 50 MHz I get a “Command or data timeout” error. Now I noticed that the example code tells me to use the FAST slew rate setting for all SDHC pins. Therefore I tried your trick with adding an Init_GPIO component with pin sharing enabled for the SDHC pins. I enabled the 5 pins and only changed the slew rate setting. For some reason the generated Init method remains empty and my SDHC still does not work at 50 MHz. Any idea what the problem may be? my K60 only allows me a SDHC frequency up to 12 MHz, so I cannot try out a value higher than that. Can you confirm that it works with a lower MHz (say 12 MHz)? 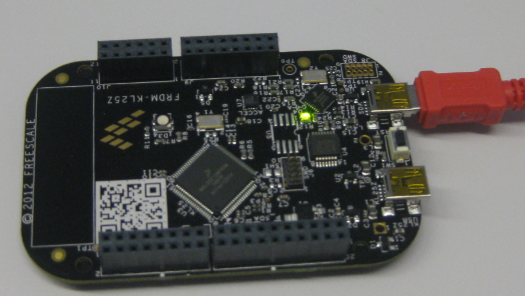 My experience is based on the TWR-K70 SDHC demo project found in C:\Freescale\CW MCU v10.4\MCU\CodeWarrior_Examples\Processor_Expert\Kinetis\TWR-K70FN1M\SDHC. I have also adapted the project to my Kwikstik (K40). The demo project writes and then reads fine at 25 MHz on Kwikstik (K40) and at 15 MHz on TWR-K70, these MHz values are dictated by the main clocks of the boards. Then I tried to go high speed, i.e. to 50 MHz on Kwikstik and 30 MHz on TWR-K70 by using the SDHC_SelectBusClock() method as described in the SDHC LDD component help. This method seems to setup the device to high speed (no error). But then I get “ERROR Command or data timeout” (LDD_SDHC_ERR_TIMEOUT) which is returned by the SDHC_GetError() method called in the SD_Wait() method wich is called right after SDHC_TransferBlocks() which is called by SD_TransferBlock() with WRITE parameter called by SD_WriteBlockPart(). I also found out that if I run the writing part in a loop at 30 MHz on TWR-K70 the error does not occur each time, but in most cases it does. If I run it at 50 MHz on the Kwikstik the error always occurs. The strange thing is that although this error occurs, the test data (I vary this inside my loop) can be successfully written to and then read from the SD card. I am not sure where the error actually comes from although it seems related to the bus speed I use. The only hint I found was that the code comments in the SDHC LDD help say that HIGH slew rate should be set on all pins but they don’t say how to do this. So I found your post and tried to set it through the Init_GPIO components by only changing the slew rate setting of the pins used for SDHC. 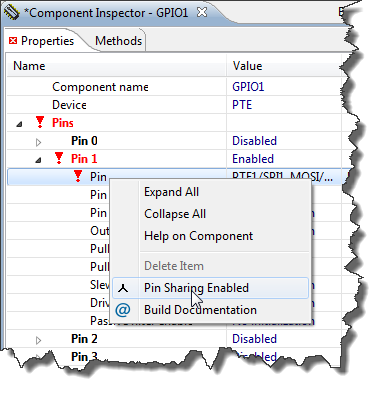 Unfortunately, this did not seem to work and it does not generate any code in the Init() method of the Init_GPIO component, this method remains empty after PEx code generation. Any hints are welcome! ah, ok, this makes it now clear. Unfortunately I do not have the K70 with me so I cannot try things. And I would have changed the slew rate as you did in the shared component. But it is not clear to me why this is necessary for SDHC operation. I guess this would be a question to Freescale. I did some more research and found out that there seems to be a CMD line conflict according to the error bits set by the SDHC controller. This may be caused by the high bus speed used I think, maybe I should also check with other SD cards, although this one reports to be high speed… It also turned out that the slew rate is actually set by PEx, but not in the Init_GPIO component’s Init() method but in the CPU.c in the PE_low_level_init() method. It also turns out that fast slew rate seems to be the default for the Kinetis (K40 at least). So the problem is not the slew rate itself. Things are so complex that it can be anywhere. I’ve read the spect of KL05 and it says that theres a way to get 25mA from PTA12, PTA13, PTB0 and PTB1 by setting up the PTx_PCRn[DSE], but I cant find out how to get them with PE. Any help about it? this setting (Drive Strength) is available in the Init_GPIO settings. 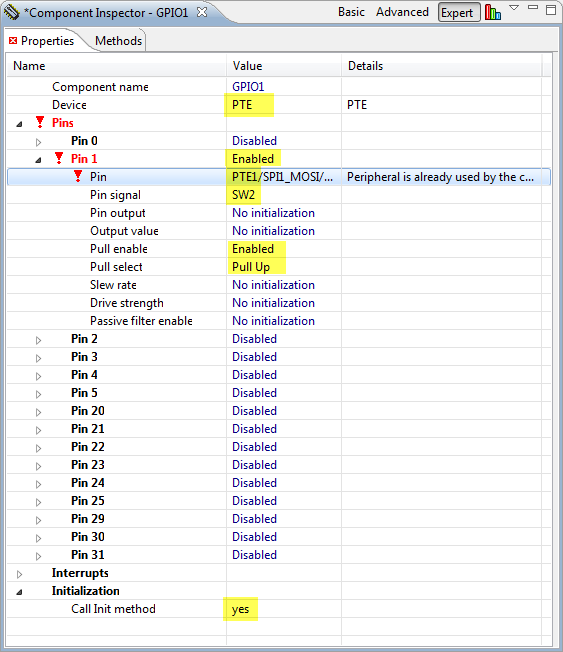 See image/screen short “Init of PTE1 with Error” of this post. Damn… you are right… didn’t see that, srry. Thanks for the project that you made, I am staring up with this kit (FRDM-KL25Z), and I am trying to learn from this tutorial. Can you please tell me how I can make this thing work. 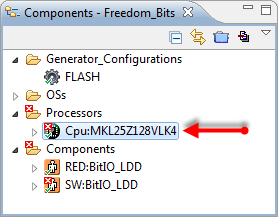 PS: I have followed the tutorial on the link https://mcuoneclipse.com/2013/01/31/tutorial-iar-freertos-freedom-board/ ………. and managed to turn on and off the led. In addition to this project, I am trying to write a code as a Data logger: to write and read from SD card from this kit………. 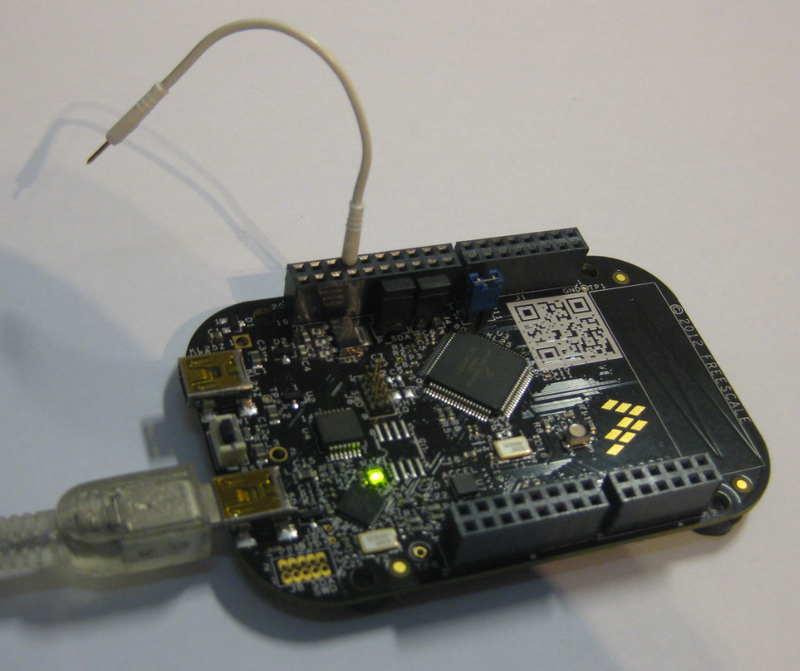 I have tried to look this tutorial, that claims it will do data logging from Arduino kit…………. https://mcuoneclipse.com/2012/11/18/arduino-data-logger-shield-with-the-frdm-kl25z-board/ I havent tried it yet. But what I would really like to do is to write a C code, debug and download it on IAR Embedded workbench IDE without using process Expert or any other software. As I told you I am new to the kit ……… can you please suggest how I can proceed. what is wrong with using Processor Expert? It generates the source code for you, so you will not have all the issues you are facing now. Processor Expert works nicely with IAR, so you have the freedom of choice. And you can use and change the source code it generates. So I suggest that you try it out. looks like your reset pin is still configured as reset. You need to change two things, and I was trapped a while ago as well as I had only changed one thing. See https://mcuoneclipse.com/2013/02/16/using-the-reset-button-on-the-freedom-board-as-user-button/ for details. I hope this is your problem? I’m using your code from github. Imported without any modifications. 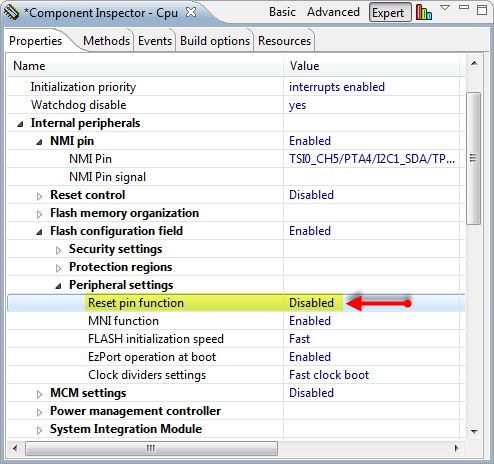 Reset function is disabled in both places in Cpu component. I wonder if it can be an issue with IDE version. I’m using CodeWarrior 10.4. Board is FRDM KL25Z RevA. I’m using 10.4 too, so this is not the problem in my view. Let me check with my board. I see now what you are saying. The code on GitHub incorporates already the second part, where I have added an additional switch. – if you press the reset button, and as long as you press reset, then the red LED is on. See the code in main() of the GitHub project. I understand how it should work. When PE1 pin is open – blue LED is off. 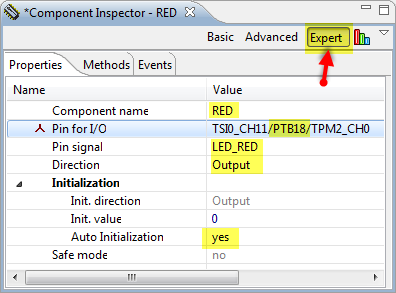 But when I’m pressing reset button (no mater if PE1 is open or shorted to GND) red LED is not turning on. The green one is always flashing for 1s after button is pressed. I suppose MCU is still resetting. Yes, this really sounds like reset is still active. You could verify this if you debug your code: halt the debugger in main, then press the reset switch. If it resets, then you will see it. There is one change I have made in your project and then ignored it:) I am using USBDM firmware instead of P&E Micro OpenSDA. It looks like with USBDM it is not possible to change reset pin functionality. 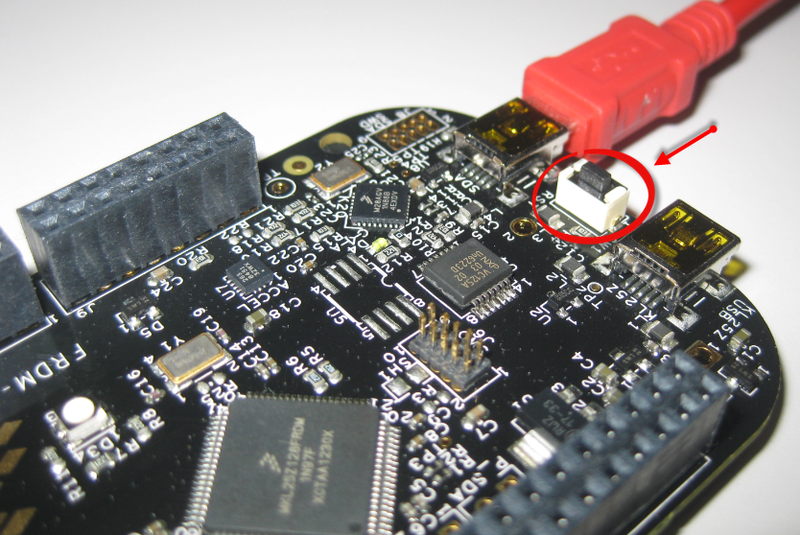 When I have disabled reset pin using P&E OpenSDA and then tried to flash MCU using USBDM – it was not possible to connect to the target. Using USBDM is important in my project as I would like to flash external MCU on my custom board. Is there any option to fix it? It works also with USBDM. I needed to erase MCU first and then it was possible to flash. It programm with USBDM but reset pin is still active. So only with PE micro OpenSDA I can use Reset pin as GPIO. Not satisfying solution. Has anyone found workaround for it? It seems like USBDM is not programming the flash configuration block? Can you check what gets flashed on your target? So this indeed could be an USBDM problem. I suggest you might check it with pgo on https://community.freescale.com/community/bdm? Do I have the wrong version of this component, and how can I get the right one? I have CW for MCU 10.5 and added your Processor Expert update files. that Init_GPIO component is from Freescale, not mine. But you are right: at least in my MCU10.5 I see the same as you: less settings. Not sure if this is a bug fix (that there was too much present in the earlier version)? I have looked more closely at the KL25Z data sheet. My reading is that the GPIO ports do not have full functionality on this part. 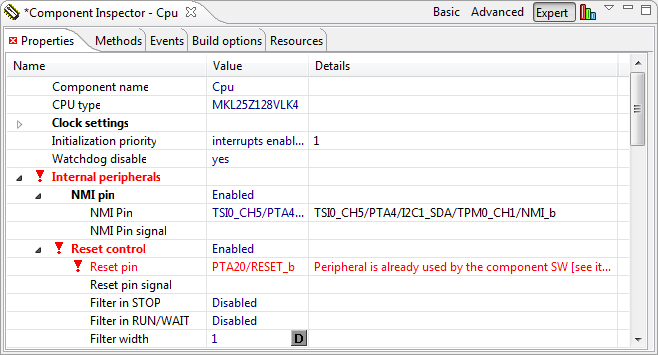 For example, there is no option for pull-down resistors, and only ports A and D support interrupts and DMA requests. So the current Init_GPIO control does appear to offer the correct options. So the question is why your screenshot appears to offer more. Maybe it was taken with a different processor? Or it is an old component that has now been corrected? I believe I have used that FRDM-KL25Z as shown in that article. But this was back in 2012, so for sure there was a different CodeWarrior version (10.2 I think) involved. Erich– Thanks alot. Seems obvious in hindsight. Kind of annoying the reference code doesn’t even come correct. I wonder if there is a tutorial that explains the Kinetis programming in c! The reason is to better understand the structure of microcontroller and not really programming! Kinetis is not really special for C programming. So if you are interested in a tutorial for C programming, there are plenty of it on the Internet. But in your second sentence you are more interested in the structure of a microcontroller (than in programming)? Now the question is if you are interested in microcontrollers in general, or especially in the ARM Cortex family of microcontrollers? If it is the later, then ARM.com has material too, including the architectural manuals and more. If it is for microcontrollers in general, there yet again there is plenty of microcontroller material: search for things likd ‘tutorial microcontroller programming’ and you should get something you could start with? My concern would be how macros are defined, which bits would be set to control something in microcontroller! I would not scrutinize datasheet, because it would take too long for a first study! Which is very close to what I was looking for! I do not intend to program directly in c. I will use the processor expert, but would like to know how things work! CAN ANYONE help me to use internal flash memory of hte cpu on IAR workbench . Can anyone help share the .h files to use . If you want to have it easy, then consider to use KDS/Kinetis Design Studio (https://mcuoneclipse.com/2014/09/28/comparing-codewarrior-with-kinetis-design-studio/) as in my view it is much easier to use than IAR, plus it is free and unlimited, and comes with everything integrated. 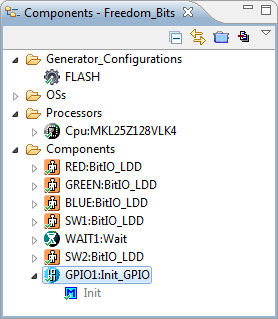 I recommend that you use Processor Expert (it is integrated in CodeWarrior and KDS). With Processor Expert it is very, very easy what you are asking for, as Processor Expert adds all the *.c and *.h to your project. 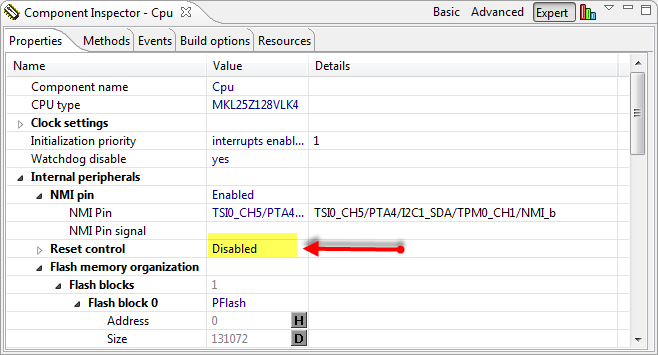 See https://mcuoneclipse.com/2014/05/31/configuration-data-using-the-internal-flash-instead-of-an-external-eeprom/. If you insist to use IAR (for whatever reason? ), then you can use IAR with Processor Expert too, see https://mcuoneclipse.com/2013/01/31/tutorial-iar-freertos-freedom-board/ for example. Did you ever simplify the code and get rid of the add’l overhead from Processor Expert. Yes, I used macros to get rid of the unneeded device handle parameters. It is a manual process, so I did that only in time critcial areas. Hello sir How can someone use UART character send froma another microcontroller to control the port of a freescale device. 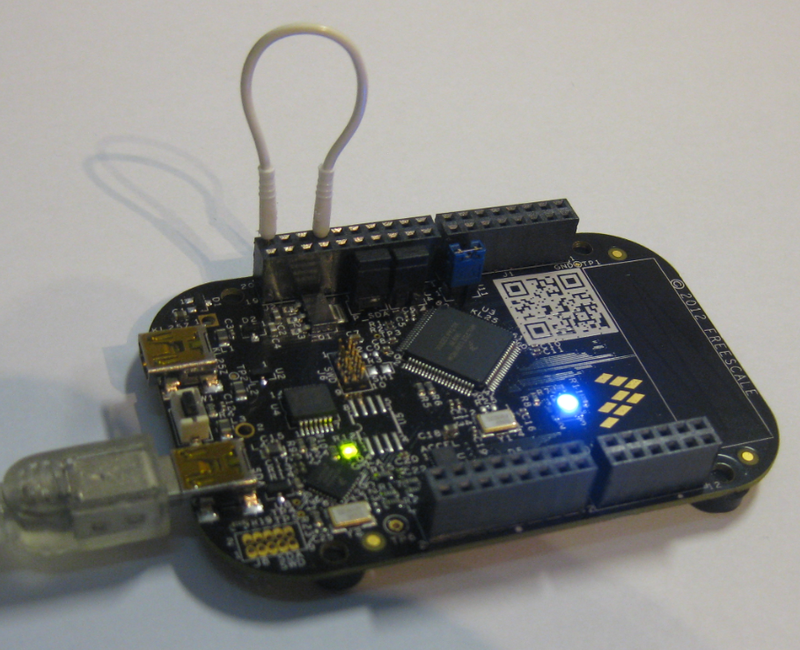 Eg data send from a Beagle Bone Black to contol the port of a freescale. Thank you sir. 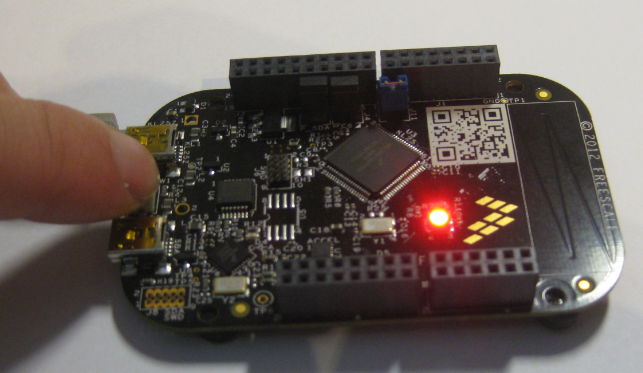 To my understanding the BeagleBone has 3.3V logic. In that case, connect the Rx with the Tx line and vice versa and handle the incoming data. Bit1_SetVal(); switches the led off and Bit1_ClrVal(); switches it on. then it doesn’t light. It is as though the extra delay caused by the extra line of code has stopped the code. have you stepped through that code with your debugger? I don’t see a problem in your source, so probably only the debugger will tell you. Thanks – I’ll check, I can’t seem to enter the debugger (from debug – configurations) so maybe I need to sort that first. Firstly, the watchdog (COP) was enabled by default. Then I realized that if I include a delay between sending, then it worked. The program sends one character and then hangs. I still cannot enter debug mode at all and can only drop and drag to the folder. yes, watchpoints are enabled by default by many devices, so you need to make sure it gets disabled if you are not kicking the dog. c) the UART interrupt will send that character (or any others which are in the ring buffer). So make sure the ring buffer size is reasonable, and your interrupts are not disabled. I’ve a doubt regarding KL25z Reset. Port A, pin 20 has the ability to restart the controller instead of manual reset. I’ve provided clock to the port A pins and made pin 20 HIGH, but the controller doesn’t seem to reboot itself. Can you suggest me what went wrong or what I’m missing. so I understand you correctly, you are using PTA20 as output pin and drive it high from the KL25Z itself? So your idea is to do ‘self reset with the reset pin’? If so, then this cannot work, as you then have configured the pin as GPIO and not as reset pin any more. You need to reset the device either with the ARM reset usinig the AIRCR SCB register or not serving the watchdog. I’ve not configured the pin as GPIO (which is usually done by choosing Alt 1 of multiplexed pin). I’m keeping it in default state, and write HIGH on the pin. Is reset not low active? And if you have not muxed the pin as output GPIO pin, you won’t be able to write to it (won’t have an effect). Or have you seen an effect on the pin with a scope? No I didn’t get any signal while writing onto the pin. Hence, it has no effect on the controller. I’ll with one of you approaches, i.e., using AIRCR SCB register. I’ve searched in the datasheet, but couldn’t find information about AIRCR SCB. Where can I find the information, Erich? let me write up an quick article about that topic and how to use the AIRCR. You should see an article about that tonight (my time). OK? If you are writing about software resets, you’ll probably mention that you can read the System Reset Status Registers to determine the reset reason. I print these as a matter of course at boot time – it can be useful to see if I have suffered a watchdog reset, in particular. Also the very wierd “core lockup” reset I had once. That’s an excellent tip, thank you! Hello, after loading your program my freescale (kl25z) remains in bootloader mode and freescale is no longer viewed as Kinetis. What can I do? thank you. Could it be that you loaded your program on the K20 instaed of the KL25Z? Can you load the debug app again on the K20? Thanks again for the wonderful blog. I need help from your side. I am using a reset switch on my custom board which i am using to go back to factory default settings. If the switch is pressed continuously for time > 5 seconds, i have to reset. I am using FreeRTOS as well. Can you please help me decide how to design this? it will be of great help to me. i have something in my mind but I am sure that it is not the right thing. Your help will be much appreciated. But the example for “BitIO_LDD for an Input Pin” just don’t work for me, I tried hardconding the bit and it works, but I just use the “(SW1_GetVal(SW1_DeviceData)==0)” statement and it just don’t follow if I press the reset button. CodeWarrior for MCU Version: 10.6 Build Id:140329.
hi , i am searching how to sharing pings but with KDS 3.0 , do you know any way? with Processor Expert it is the same in KDS. :(, but in kds there is no expert mode and sharing enabled; or i can’t find it. Later Processor Expert only has Basic and Advanced modes. Simply select ‘Advanced’. I have a 15 segment led char display. I have connected it to a MK10DN64 MCU on ports PTA, PTB, PTD and PTE. 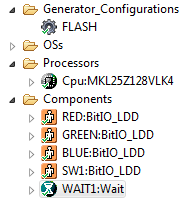 i use BitsIO_LDD to configure the pins and now i have 8 different generated files of .c and .h . i want to display different alpha-numeric characters. How can i do it.need some info. It is probably better if you control each pin individually instead as a byte. That way you can turn on/off each segment as you want. You need to write a routine which writes each digit, and for this it needs to turn on/off individual pins.